In this project we develop and use a novel electron source that enables us to perform fundamental research with free electrons. Our approach for such a source is the following: We focus light pulses of a duration of femtoseconds onto a nanometric metal tip, which ends in a hemisphere with a radius of typically 10nm. Owing to the small dimensions of the tip, the optical field is strongly enhanced at the apex, where peak intensities of up to 1013 W/cm² are obtained. Thereby electrons are emitted from a nanometric emission area on a femtosecond time scale by highly nonlinear photoemission processes. The unprecedented temporal and spatial control over the emission process on femtosecond and nanometer scale will be used in further applications. Presently, we are investigating the physical mechanisms and ultrafast dynamics of the photoemission process and characterize the coherence properties of the emitted electron wave. Due to the rather simple experimental setup and the high control of the tip surface on the atomic level, such a nanometric metal tip is an ideal model system to study light-matter interactions in the strong-field regime. The wider applicability of such a source is also investigated in our group in the context of electron acceleration or time-resolved electron diffraction. As a first result we gained insight into the photoemission process. Employing a Titanium:Sapphire oscillator operating at 800 nm with 6 fs pulse duration we have found that single electrons acquire the energy of up to 6 photons more than actually needed to escape from the metal, a phenomenon that is called Above-Threshold Photoemission (ATP). Furthermore, at incident intensities of a few 1011W/cm2 strong-field effects occur which cannot be explained in a simple photon picture. In general, those effects start to be observable in the electron spectra once the mean kinetic energy (ponderomotive energy) of the emitted electron oscillating in the light field is comparable to the photon energy. We have for the first time observed these effects in ATP (see Fig. and Ref. ). Above-Threshold Photoemission. Electron spectra for different intensities (various colors). The peaks correspond to the absorption of 3 or more photons; their number is indicated in the circles. Note that the lowest-energetic peak (3-photon peak) is surpassed in amplitude by the second (4) as intensity increases. December 2010. 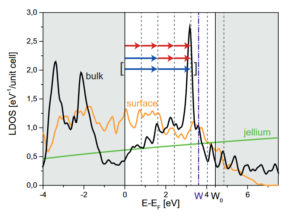 Animation of the carrier-envelope phase dependence of electron spectra. July 2011. In extremely short laser pulses the shape of the laser field within the envelope can be controlled with the frequency-comb technique (Nobel Prize to T. W. Hänsch). The controlled quantity is the so-called carrier-envelope phase (CEP) of the laser pulses, i.e., the relative phase between the maxima of the carrier wave and the intensity envelope. We could show that electron emission is sensitive to the CEP and hence to the waveform of the optical field. The spectra show a strong dependence on CEP, see the animation. From theory models we infer that electrons are photo-emitted, propagate in the laser field and are pulled back to the tip by the optical field. There they scatter elastically, gain more energy in the laser field and are only then detected. Depending on the CEP this can happen once or twice per pulse. If it happens twice interference arises, which leads to the strong maxima and minima that can be seen in the animation for CEP ~π. This is the time-energy analog of the famous Young’s double-slit experiment, where interference also only arises if particles can fly through two slits simultaneously. Here the laser field creates slits in time. A typical rescattering spectrum. July 2011. As already touched upon in the last paragraph, we have evidence that electrons are influenced by the light field so strongly that they return to the tip’s surface within about 2/3 of an optical cycle after emission and recollide with it. This mechanism is foundational for attosecond science which is usually performed with atomic or molecular gases, but now also possible at solid surfaces. Recollision manifests itself (among effects like High-Harmonic Generation) in high-energy photoelectrons that form a plateau structure in the energy spectrum (see Figure). These electrons originate from elastic scattering at the metal surface, the so-called rescattering effect. We were able to understand the relevant physics with a simple semiclassical model lent from atomic physics, the very successful Three-Step Model. A much more realistic model from solid-state physics was applied to our system by the Burgdörfer Group at the TU Vienna: Time-dependent density functional theory (TDDFT), which agrees very well with the data. The models show that we are able to control the electron motion on the attosecond time scale by the waveform of the driving laser field, given by the CEP. The newly observed phenomena might ultimately lead to the realization of lightwave electronics, i.e., electronics with optical driving frequencies (about 100,000 times faster than today’s standards). Given the well-controlled tip geometry, metallic nanotips are an ideal model system for near fields. Here we briefly describe two experiments we conducted. In one experiment we employ our understanding of the rescattering process to measure the peak near-field intensity at the tip. We identify the radius of curvature of the tip apex and the dielectric permittivity of the tip material as critical for the generation of strong near fields. The maximum kinetic energy (the cut-off in the above-mentioned plateau) that electrons can reach by the rescattering process is given by their ponderomotive energy and the work function of the metal. By measuring the electron spectrum, we can therefore identify the light intensity that electrons have experienced in the near field and compare it to the incident laser intensity. We thus obtain a field enhancement factor and probe the near field on the nanometer scale. Schematic of the rescattering-based measurement of field enhancement. An incident laser pulse excites a near field at the nanotip, which leads to electron emission. A part of the electrons rescatters in the near field and thereby samples it. The cut-off in electron energy spectra gives access to the near field intensity. In a second experiment, we characterize near fields directly in the time domain with attosecond resolution for the first time using attosecond streaking. In a collaboration with the Kling group at the Max Planck Institute for Quantum Optics and LMU Munich we direct a 4.5 femtosecond (fs) near-infrared pulse and a 220 attosecond (as) XUV pulse at a gold nanotip. The role of the infrared pulse is to excite the near field to be measured and the XUV pulse serves to emit electrons by the photoeffect. The final energy of these XUV-photoelectrons is modulated as a function of delay of the two pulses, as the XUV photoemission takes place at a different phase of the near field oscillation. 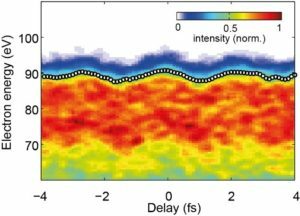 This energy modulation allows to completely characterize the temporal evolution of the near field with attosecond resolution. One important figure of merit of an electron source is its transverse coherence. With the help of a carbon nanotube-based electron biprism beam splitter fabricated in collaboration with the Högele group at LMU Munich we have recorded electron matter wave interference fringes of electron emission from a nanotip (see figure). The spatial extent of the interference fringes is a direct measure of the coherence of the electron beam. As can be clearly seen in the figure, the two interference images and thus the coherence of the two electron beams is about the same. On the left, electrons laser-emitted from a sharp tip interfere, whereas on the right DC field emitted electrons interfere. It is well-known that DC field emitted electron beams possess the highest coherence of standard electron sources, which is why these sources are employed in the best electron microscopes, in so-called cold field emission or CFE guns. It is of great interest for future applications in time-resolved electron-based imaging that laser-triggered electron beams possess a coherence almost as large as that of a DC field-emitted beam. In this experiment we demonstrate that despite the complexity of the solid state with various efficient decoherence mechanisms electron emission from a nanotip can be switched by the phase of light. To that end we shine two coherent laser pulses of commensurate center frequency at a tungsten nanotip, one at 1560 nm and one at 780 nm. We observe that electron emission can be switched on and off with a visibility of up to 98% with the phase delay between the colors. Investigating the behavior of several multiphoton orders with phase delay and the scaling of emitted current with laser intensity we find two classes of pathways that lead to electron emission, which can constructively or destructively interfere. Our findings are supported by time-dependent and ground-state density functional theory calculations performed in the Burgdörfer group at TU Vienna. Coherent control of photoemission. We display the density of states of bulk W(310) in black, as well as the density of states at the surface (yellow) and the assumptions of a jellium model (green). Two different pathways to a prominent bulk state extending to the surface involving different numbers of photons of the respective color are indicated. March 2016. Markus Schenk, Michael Krüger and Peter Hommelhoff, “Strong-field above-threshold photoemission from sharp metal tips”, Phys. Rev. Lett. 105, 257601 (2010). Michael Krüger, Markus Schenk and Peter Hommelhoff, “Attosecond control of electrons emitted from a nanoscale metal tip”, Nature 475, 78 (2011). Georg Wachter, Christoph Lemell, Joachim Burgdörfer, Markus Schenk, Michael Krüger and Peter Hommelhoff, “Electron rescattering at metal nanotips induced by ultrashort laser pulses”, Phys. Rev. B 86, 035402 (2012). Sebastian Thomas, Michael Krüger, Michael Förster, Markus Schenk and Peter Hommelhoff, “Probing of optical near-fields by electron rescattering on the 1nm scale”, Nano Lett. 13, 4790 (2013). B. Förg, J. Schötz, F. Süßmann, M. Förster, M. Krüger, B. Ahn, W. A. Okell, K. Wintersperger, S. Zherebtsov, A. Guggenmos, V. Pervak, A. Kessel, S. A. Trushin, A. M. Azzeer, M. I. Stockman, D. Kim, F. Krausz, P. Hommelhoff, and M. F. Kling, “Attosecond nanoscale near-field sampling”, Nat. Commun. 7, 11717, (2016). Dominik Ehberger, Jakob Hammer, Max Eisele, Michael Krüger, Jonathan Noe, Alexander Högele, and Peter Hommelhoff, „Highly Coherent Electron Beam from a Laser-Triggered Tungsten Needle Tip”, Phys. Rev. Lett. 114, 227601 (2015). 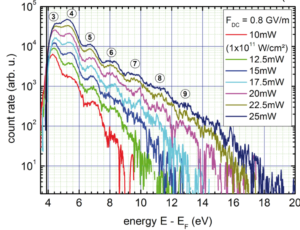 Michael Förster, Timo Paschen, Michael Krüger, Christoph Lemell, Georg Wachter, Florian Libisch, Thomas Madlener, Joachim Burgdörfer, Peter Hommelhoff, “Two-color coherent control of femtosecond above-threshold photoemission from a tungsten nanotip”, arXiv:1603.01516 (2016). Johannes Hoffrogge, Jan Paul Stein, Michael Krüger, Michael Förster, Jakob Hammer, Dominik Ehberger, Peter Baum, and Peter Hommelhoff, „Tip-based source of femtosecond electron pulses at 30 keV”, J. Appl. Phys. 115, 094506 (2014).